Any player who is 70 years of age or older prior to, or during, the calendar year in which such player plays his/her first local league match and has achieved the same rating level or lower for the three prior years, without benefit of appeal, will be granted an appeal if they are promoted at year-end. 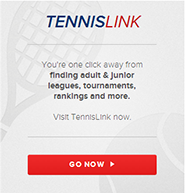 Players who play exclusively in the Mixed Doubles Division, receive a Mixed Exclusive Rating, and choose to participate in the Adult, Senior, and/or Super Senior Divisions the next year must enter those divisions by self-rating with the minimum rating being the higher of the self-rating or mixed exclusive rating. No one is to appeal a rating for another player without consent of that player. A grievance can be filed and penalties may include suspension from league play. Players who received a Benchmark Rating from State, Sectional, or National Championship play will not be able to appeal their rating for 1 year. Some players will receive a Benchmark rating from play in Local Playoffs. Those players are considered Local Benchmarks and may appeal their ratings. Appeal Instructions: NTRP Computer Ratings are automated. To appeal your rating click on "Find Your Rating" above. You must enter your USTA NUMBER to appeal your rating. Click "Appeal Rating" and follow form instructions.